In central Ohio where I live, the winter is a time of rest for many animals. They seek shelter from the cold weather and hunker down. Some large animals hibernate, many smaller ones become inactive, in a sort of torpor that is less long-lasting. If there is a “break” in the cold they can become active relatively quickly. Among the arthropods, there are many insects that enter a state called diapause. In this physiological state they literally pause their normal development and delay progression into the next phase of their life cycle (adulthood for example). 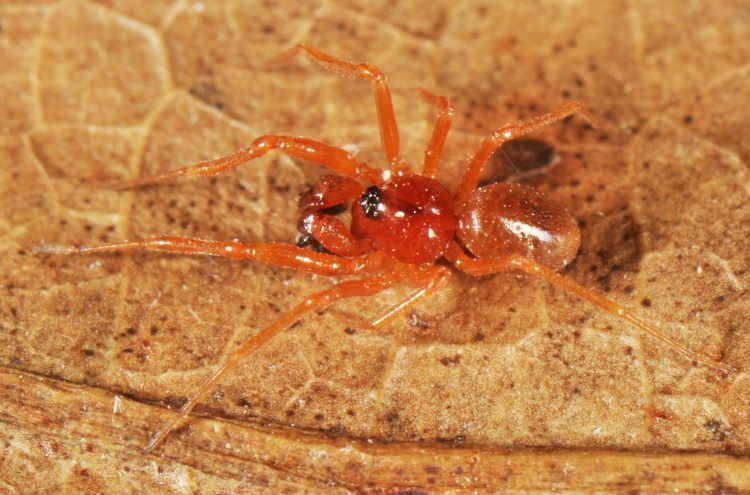 Our Ohio spiders pass the winter in almost every possible condition. In some species the adult female builds an egg case and lays the eggs in the fall. She will often stay with the egg case, guarding it from potential harm (mostly by parasitic insects, such as wasps). She may die there, or somewhere nearby. 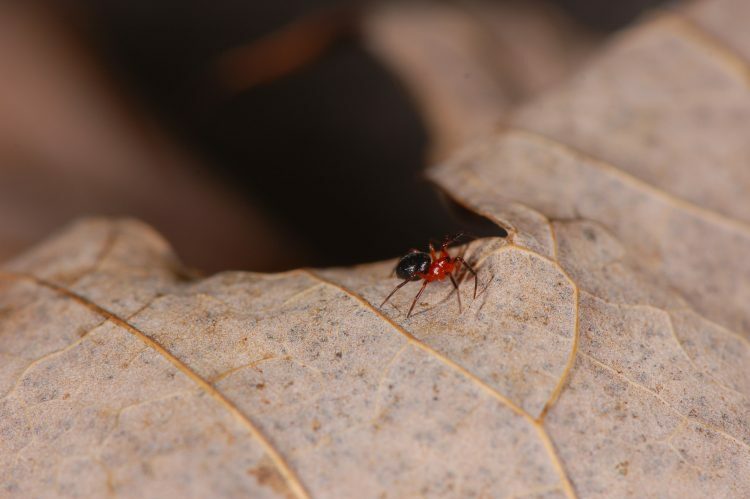 For these species the population in winter exists as scattered egg cases, under logs, in the leaf litter, cracks in the soil, or under the bark of trees and shrubs. A few species are “hardy” and survive through the winter as full-sized adults. These adults usually select a hidden retreat. Many of these spiders construct a silken sac and spend the winter ensconced there. Below are photos of a few such species. 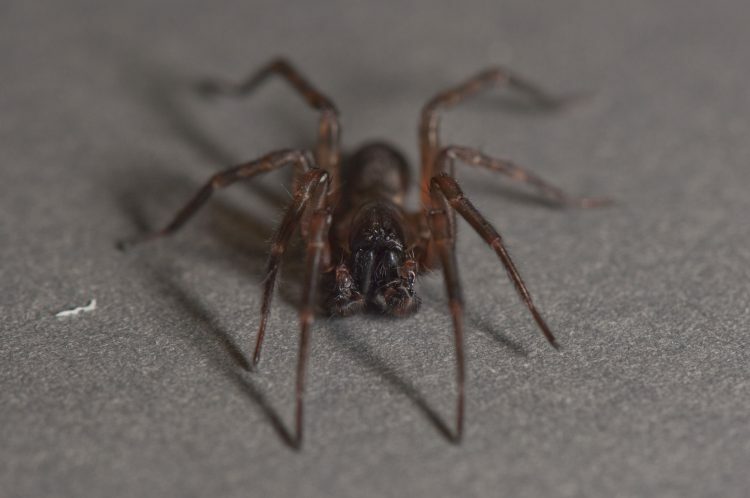 In my experience these spiders are often located by searching under logs lying on the ground, the older and more thoroughly decomposed the better. Before exploring this sort of habitat it is important to realize that by turning the log you are exposing the residents there to a hostile environment, dryer, often colder, than before the log was moved. So do this sparingly, only if you have a good reason, and always return the log as close as possible to the position it was in before you began your exploration. 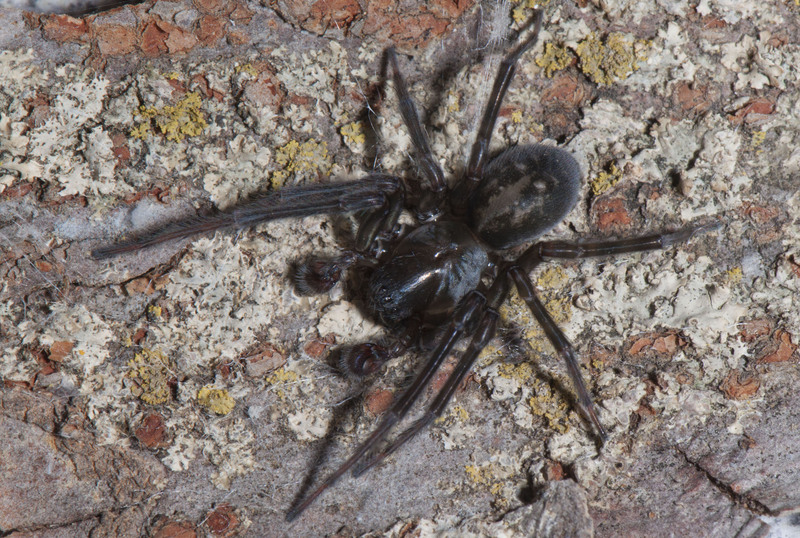 A majority of the spiders found in the winter will be immature. Some of these developed through the summer and autumn and are nearly mature. 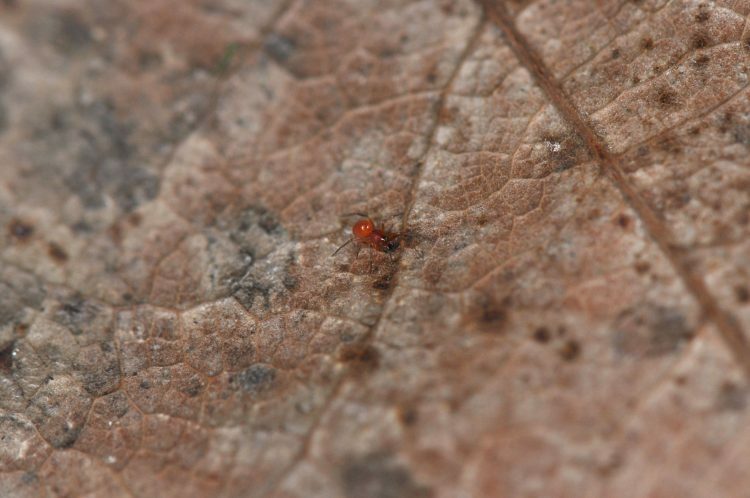 The ones which are in their last immature instar are referred to as “sub-adult” because after one more molt they will become mature, reproductively capable, adults. 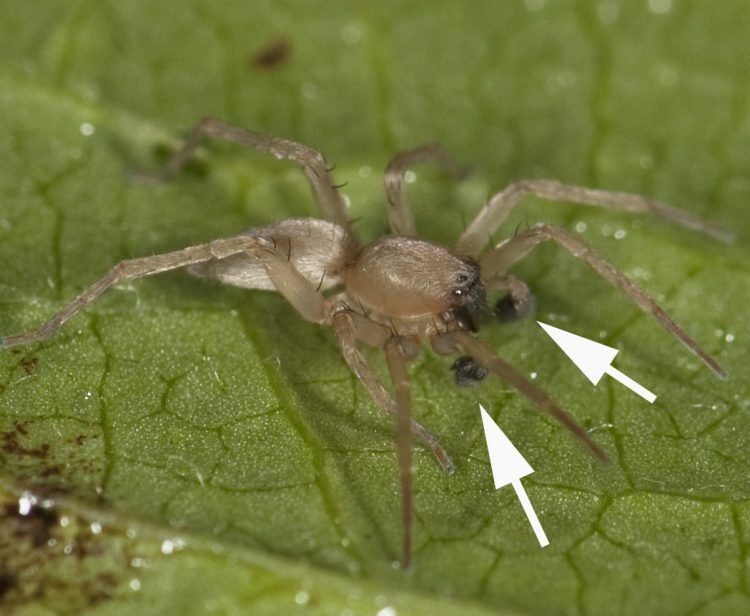 The males of these subadult spiders often show expanded palps, but they are smooth-looking. 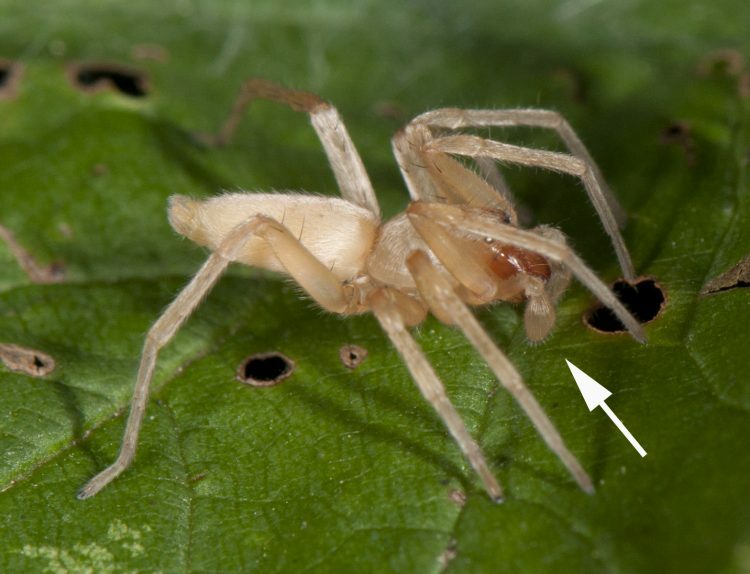 These can easily be distinguished from the mature males’ palps which typically have a much darker coloration and many visible angular, bulging, or complex-shaped structures. Here is one example of a sub-adult male sac spider. This is a photo (below) of what is probably the same species after achieving adulthood. Note the difference in the appearance of the palps. The body is also a different color, but some of that difference is just individual variation. Many of the spiders that I have found in the winter were living among the layers of fallen leaves on the forest floor. This material is referred to as “leaf litter” and is the key building block material of developing forest soil. For organisms living on the ground stratum, the falling leaves in autumn constitute a major input of energy (think stored chemical energy in the dead leaf tissues). 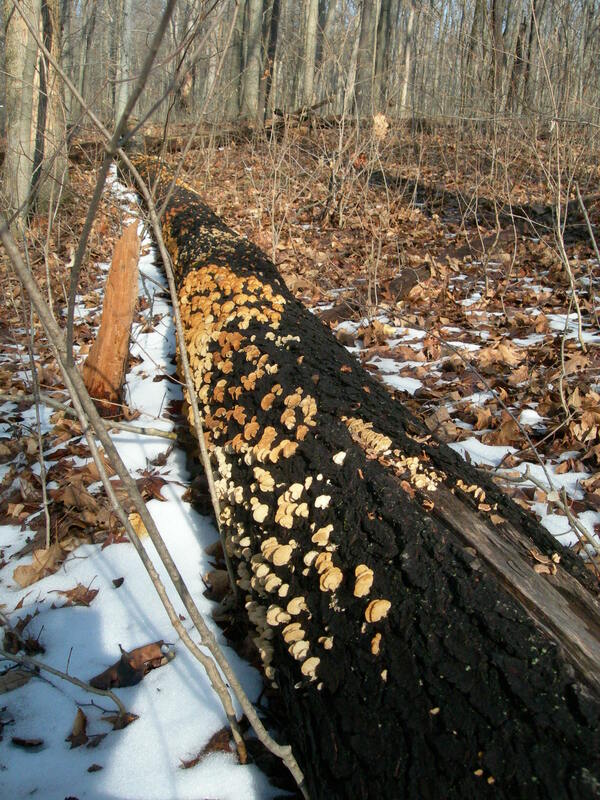 This material (dead logs, fallen twigs, bark, and leaves) becomes food for a wide variety of fungi and bacteria. A large number of tiny animals feed on the fungi and bacteria including springtails (order Collembola) and a great variety of mites. 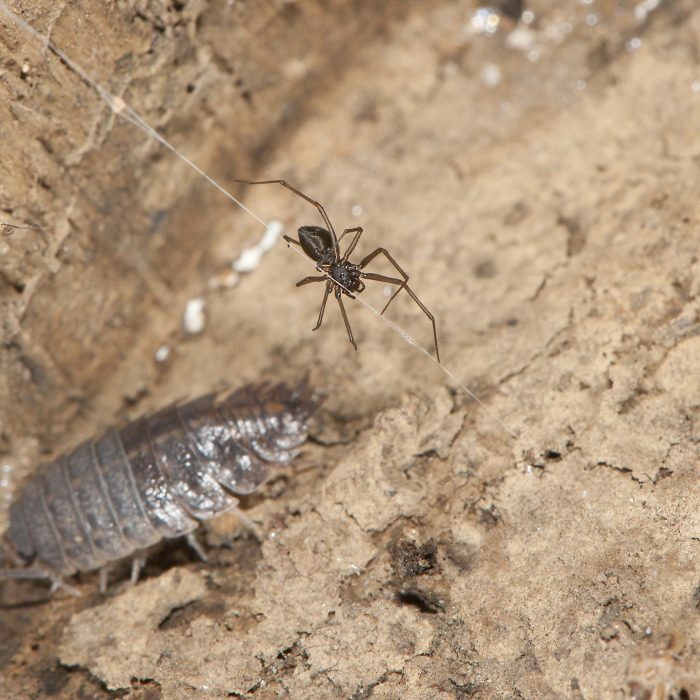 Such critters are prime food for tiny spiders living in the same areas. This amazing soil community is often at its peak of abundance and diversity in the late winter. Think of those falling leaves of autumn as similar to the spring flush of growth, but the growth in this case is of decomposers and the organisms that feed on them. 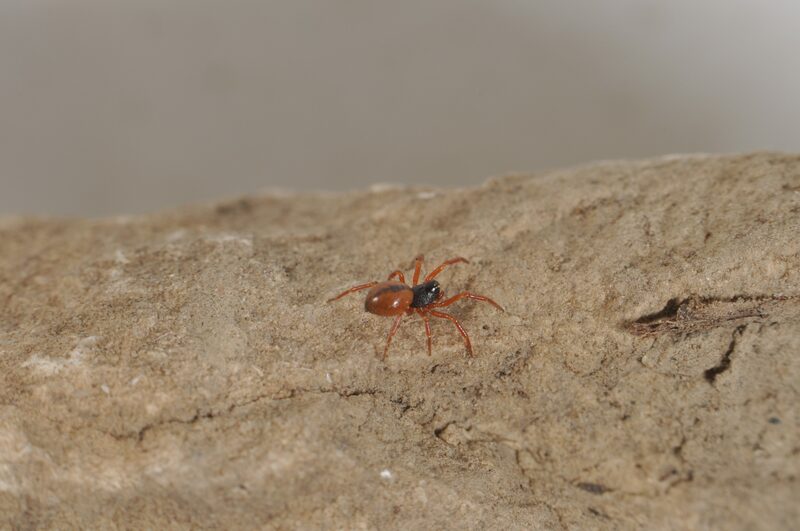 Some tiny spiders, such as those in the sheet weaver family (Linyphiidae) are mature and even court and mate during this time. They live in the upper layers of soil, hidden under the leaves, and sometimes snow. 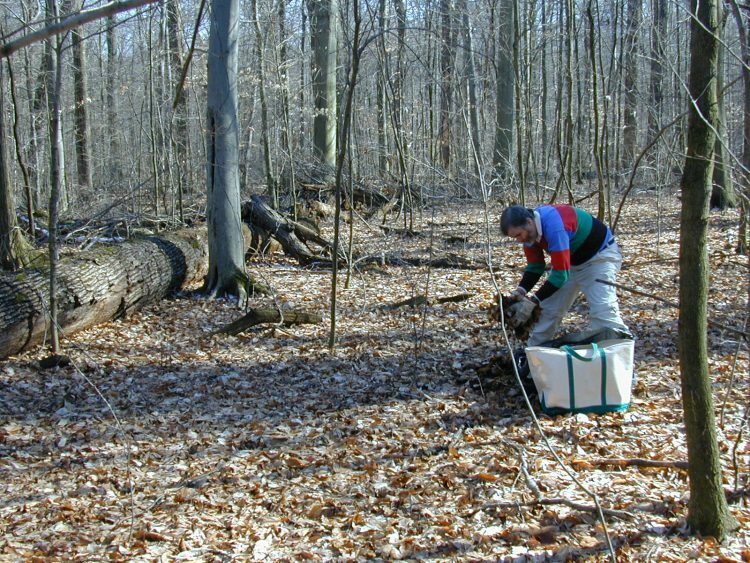 To study these communities, biologists often sample the leaf litter as you can see in this photo. What you can’t see in the photo is a large plastic garbage bag for the sample. The “tote” is a convenient way to carry this plastic bag. After collecting the litter, it is placed in a device referred to as a Berlese funnel. The name is in honor of the Italian entomologist Antonio Berlese (1863-1927) who invented the basic technique. Later modified by the Swedish entomologist/arachnologist Hugo Albert Tullgren (1874-1958) who introduced the use of a light bulb for the source of heat. Basically the leaf litter or soil sample is placed in a large funnel over a screen. In modern apparatus a light is suspended above the sample. As the leaves and soil heat up and dry out, the organisms living there migrate down to the bottom of the sample and drop through the funnel into a collecting container. These samples can be very rich. 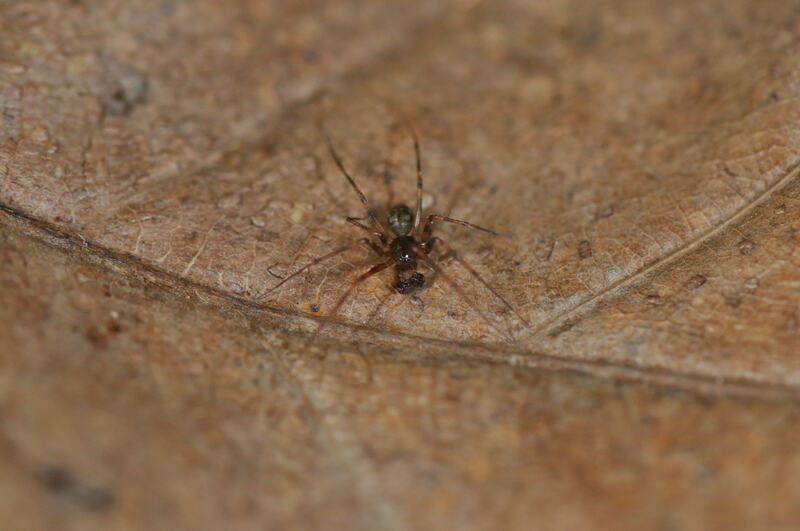 Here are some of the sheet weaving spiders (family Linyphiidae) that I have found in leaf litter during the winter months. 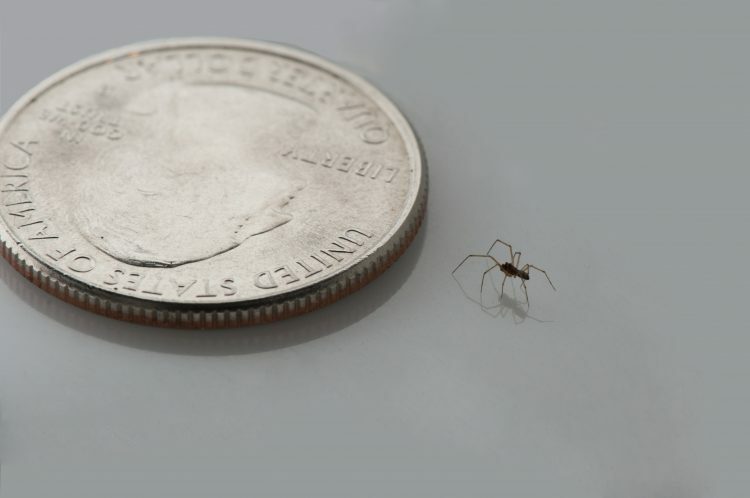 These are really small animals, even as adults. Here are a few shots with familiar objects included in the photos for scale. 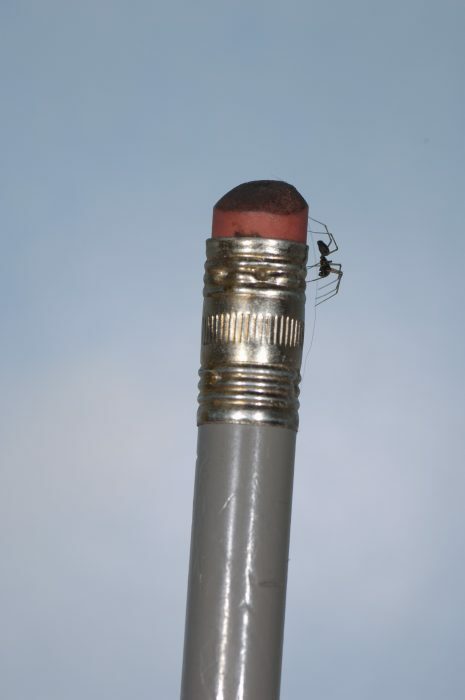 Other spiders spend the winter as tiny juveniles. 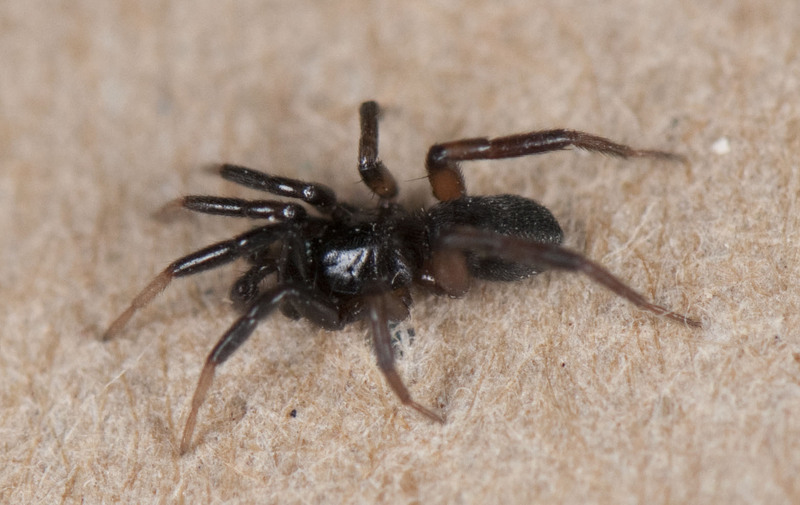 One example is this little immature Drassyllus sp? 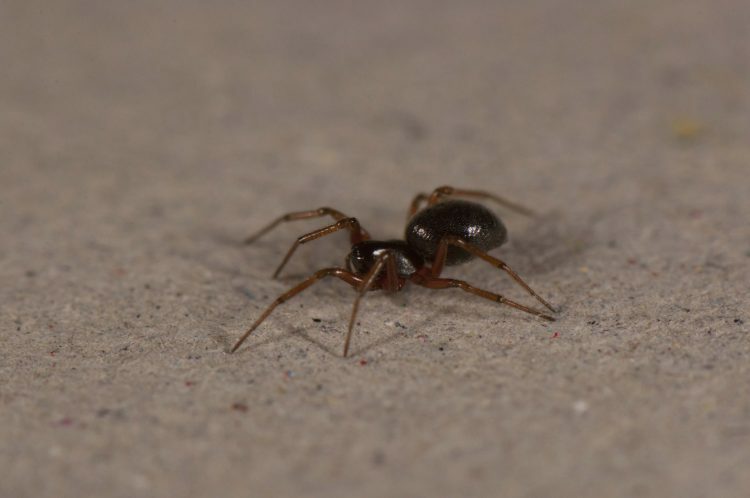 (family Gnaphosidae, the stealthy ground spiders). 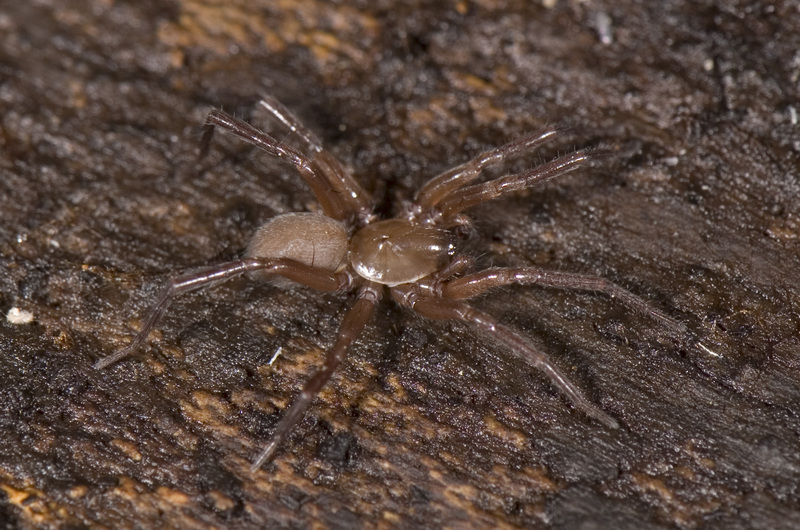 It is very pale in color, not unusual in juvenile spiders. It will grow up during the following spring or summer to be a ground dwelling predator that is very dark in color. 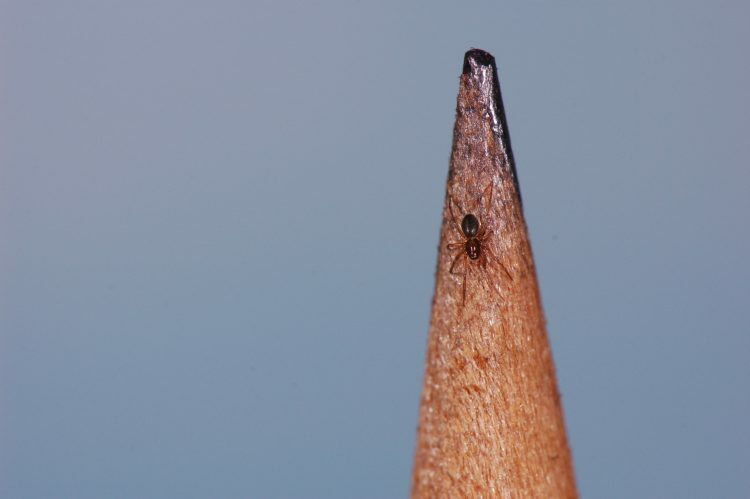 Here is an adult male Drassyllus depressus, one member of the genus to which this little spider belongs. He (the adult) isn’t a huge spider either, having a total body length (without legs) of about 5 mm (3/16 inch). 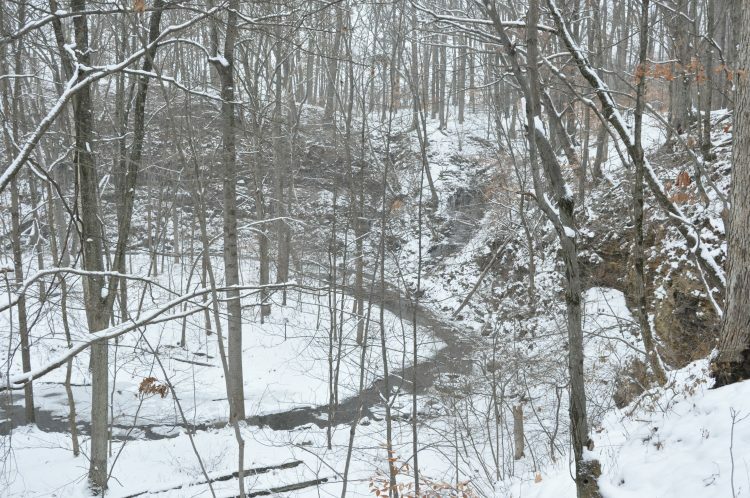 The next time you step into the woods for a winter walk, consider that you are probably surrounded by a busy community of organisms living hidden away from view. These winter spiders may not be as obvious as the beautiful orb-weavers of the summer, but they are vital links in the food web. Great article. I saw a cobweb spider two days ago and I knew some over wintered but I had no idea it was so many! New one for my yard list on the last day of the year–I was not expecting this! About five feet off the ground (I quickly decided against riffling the leaf litter) in a juniper (red cedar). Her white line really stood out. Presumed Araneus miniatus; Cape May County, NJ. Oooh, very nice find. 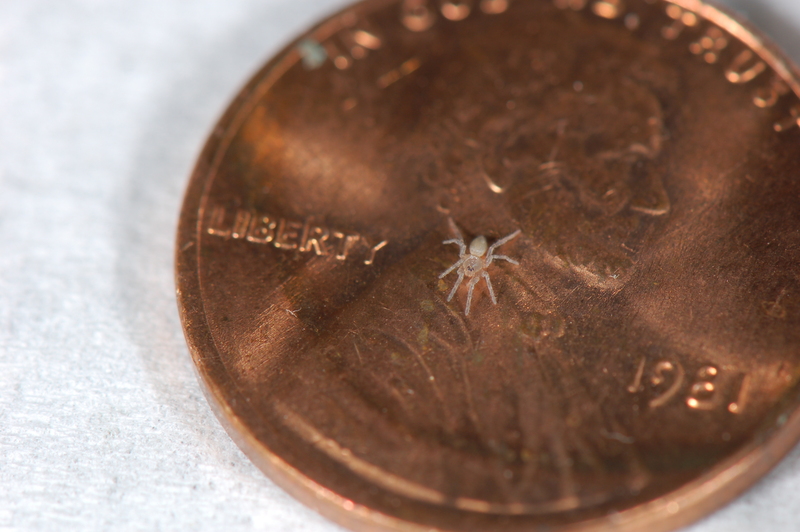 These little orbweavers seem to show up in a pattern that suggests that they are widespread, but non very common. When they are found (as with Araneus niveus this year in my neighborhood) there may be several. 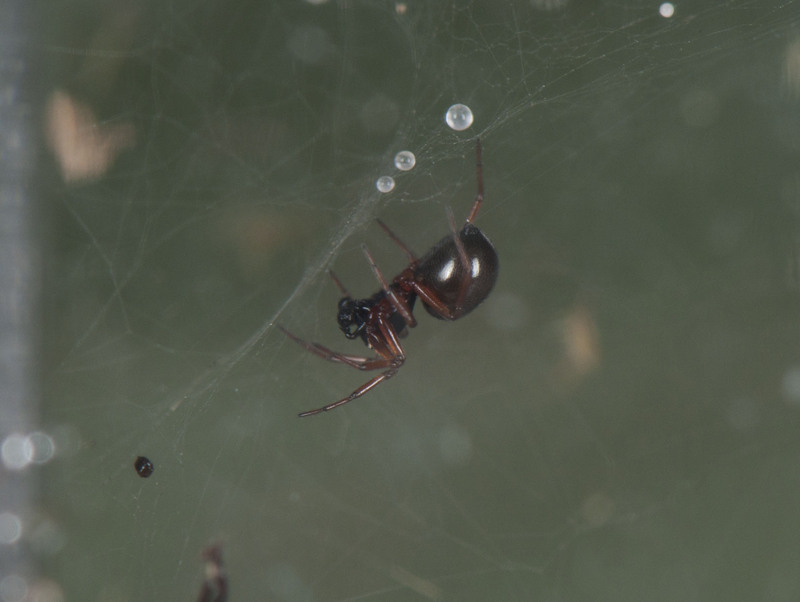 In the published work on these little Araneus Levi mentions that few are captured in sampling efforts, but they are found in wasp nests (wasps such as Trypoxylon which provision their nests with paralyzed spiders as food for the wasp larvae).